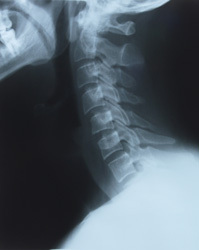 A subluxation is the result of spinal bones with improper motion or position affecting nerve communications between your brain and your body. Distorted nerve communications can be an underlying cause of many health problems. A subluxation is a stress response. Muscles go into spasm. Spinal bones lock up. And adjacent nerves are choked or chafed. This interferes with the control and regulation of your body. This garbles communications between the brain and parts of your body. Distorted nerve communications can be an underlying cause of many health problems beyond just headaches and back pain. For example, interference with nerve impulses going to or from your stomach: stomach problems. Your nervous system controls every cell, tissue, organ and system of your body. These nerve impulses travel through your spine. So having a spine free of subluxations is essential for optimal health. Only a chiropractic examination can detect subluxations. And only chiropractic adjustments can reduce their effect to your nervous system, naturally. Find out if you have subluxations before they become more serious and more difficult to correct. How come I’ve never heard of subluxations before? True, subluxations have not received the press that say, AIDS, cancer, cholesterol or heart disease have. However, subluxations are just as important and are often the underlying cause of a wide variety of health problems. How do you get subluxations? There are three basic causes of subluxations. Physical causes include slips and falls, accidents, repetitive motions, and improper lifting. Stress, anger and fear are examples of emotional causes of subluxations. Alcohol, drugs, pollution and poor diet can be chemical causes of subluxations. How can subluxations be corrected? The primary form of care to reduce subluxations is a schedule of chiropractic adjustments. By applying a specific and precise force, in the right direction and at the right time, over time, changes in the position and motion of spinal bones can be made. How can I tell if I have subluxations? You can have subluxations and not even know it. Like the early stages of tooth decay or cancer, subluxations can be present before warning signs appear. The results of a thorough examination can show the location and severity of any subluxations you may have. Can subluxations clear up on their own? Sometimes. Today’s hectic lifestyles are a constant source of subluxations. Fortunately, our bodies have the ability to self-correct many of these minor problems as we bend and stretch, or when we sleep at night. When subluxations don’t resolve, you’ll want to see a chiropractor for an adjustment!